On this edition of No Holds Barred, host Eddie Goldman speaks with our colleague and correspondent Charles Farrell about some of the latest and not-so-greatest in boxing, and the Floyd Mayweather Jr.-Shane Mosley fight, which takes place Saturday, May 1, in Las Vegas, Nevada. The Mayweather-Mosley fight will be shown live in the U.S. on HBO pay-per-view and in the UK on Sky Sports 1. But we begin with a commentary on one of the truly underrated overachievers in boxing, John Ruiz, who just announced his retirement. Few appreciated why he fought like he did, in a clutching style often not pleasing to the eye, but which landed him near the top of the heavyweight division for almost a decade. 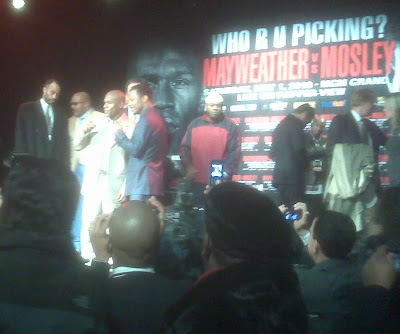 The Mayweather-Mosley event has once again been preceded by a series of near-mindless infomercials on the HBO 24/7 series. Instead of ruminating on whose uncle said what, we discuss the careers of both fighters, their styles, and what each man must do to win this fight. Despite the cheapening of it by all the nasty rubbish which has been heaped upon us, this fight still is an important one and may actually end up being rather entertaining. We also once again rip the clueless and compromised boxing media, whose members seem only to understand how to please promoters and networks enough to be buddies with the suits and get ringside press credentials. We give no quarter to these shills, hypocrites, and mediocrities who pose as journalists and writers, and we even do so without cussing. Our lengthy discussion also takes us to many other issues in boxing, and is candid and on a high level because, unlike the guys who run the sport, we respect our audience. Bragging Rights Corner, for news and always independent opinion about the sport and business of boxing. Check out their web site at http://www.braggingrightscorner.com/.